A "Van Gogh Pincushion", a gift for my acupuncturist. I have written many blogs about living life with Chronic Lyme Disease. 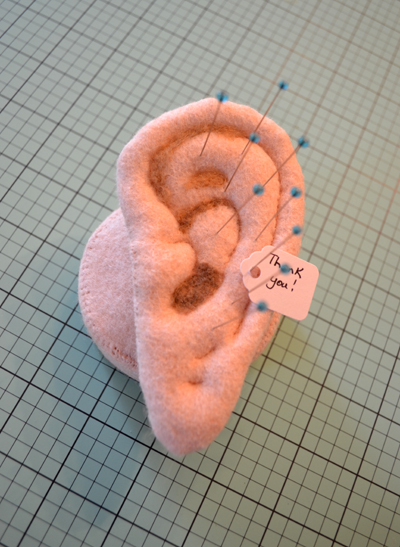 It is no secret that sewing is top on my list of therapies, and now I have discovered another new needle art that provides yet more healing: acupuncture! I have just recently been evaluated at our local cancer center for possible hemachromatosis, a condition where a person absorbs too much iron, resulting in high ferritin blood levels, which can cause pancreas and liver damage if not treated, as that is where excess iron gets stored. My dad was discovered to have it many years ago. It can be hereditary and so my siblings and I were tested along with our children. What I didn't know and just found out, is that women often don't develop it until after menopause as apparently their monthly periods can self-correct the problem. Learning that, I had myself re-tested using a newer genetic test for this blood condition. I was found to have one genetic marker making me more susceptible to developing it and so I will be followed for about a year to be sure that my ferritin tests don't rise. My status of being a patient at the cancer center, along with having some pain, made me eligible for acupuncture treatments via a grant. I was eager to accept their generous offer for this care. Having an affinity for needlework of all kinds, and being a nurse, I am not afraid of needles, not even when used for healing. I learned years ago that the needles used for acupuncture are so very fine that the most you feel is a slight pick and had acupressure treatments with massage years ago, and found them most helpful! I have now had two treatments, both with great results!! My first treatment involved several needles in each ear and only twenty minutes later I found myself "at one with the table" I laid on. The acupuncturist told me that he was going to calm what appeared to him as my agitated state of mind along with some work on my upper intestine. How appropriate, I thought systemic inflamation does inflame the brain and the digestive system is the center of a person's immunity and I indeed had immune issues. He told me that it would stimulate my sludgy gut as well. I had been doing much thinking and worrying about what seemed to be "mounting" medical issues and I welcomed aid in relaxing as I faced changes in my present long term treatment for lyme and all the challenges I would have in finding appropriate support. Driving home after my acupuncture treatment was an amazing experience. I had never noted this short drive home to be so beautiful! I noticed the temperature of the breeze, the sunshine, the trees and mountain ranges, and the splendid feeling of cruising the highway. Further effects came later that week. My intestines seemed to work as they never had, and I was more focused and better able to sort through data that had been burdening me for some time, and when I felt anxious, I sought a private and quiet space. These were all great alternatives to rushing around without paying attention to what was around me, experiencing much anxiety and worry, feeling constipated, and overwhelmed. I am often guilty of tackling what is difficult in a "crash and burn" fashion without taking pauses, no matter how stressed it made me, but not this week! My second acupuncture, a week later, was equally, if not more effective and the needles must have gone a little deeper, for the issues I had complained about were gone, though others replaced them. I experienced a sudden sadness and a rush of thoughts and feelings that I hadn't thought about in a very long time. Viewing messages on Facebook, I saw happy relatives vacationing and winced, remembering times when I wondered why our life had such few carefree moments, only to learn later that I had a chronic illness that often took pleasure from the present moment. My illness was so insidious that I hadn't realized how much it was robbing me of the energy to live life as fully as I wished. This dark mood came on suddenly! It was like my treatment had tapped a vein of sadness that I had struggled to deal with much of my life. These resurrected feelings, I had thought were long since resolved, but maybe not? They were ones that had taken years of counseling, and here they were again. I didn't dwell on them but did recognize that they were still there, and made me realize that these deep-seated feelings still have a bit of a hold on me, literally creating "dis-ease" in my body. The mind-body connection never ceases to amaze me. I had to see it for what it was, emotional pain that connects to my chronic disease. While I had dealt with my feelings years ago, how they connected to my body was a fresh reality to me. Recognizing and honoring them as manifestations of my present dis-eased physical state was just what I needed in order to deliberately let go of their residual and give myself permission to stop the discomfort of being who and what I am. It is really OK to be me and treat myself kindly, and love and respect all of me, mind, body and spirit and I will forgive those that taught me otherwise. Another vein of truth that opened for my healing was the understanding and compassion for those that taught me not to accept myself, as they treated themselves the same . I am sure that they didn't know how to do different or surely they would have. I will not wallow in these feelings. They have come out in response to my acupuncture treatment so their residual can be released. My acupuncturist's goal had been to find the "heated, and inflamed areas and quell any allergic responses, including itching and irritation they create". He also worked "to promote circulation to improve my general well-being and healing of my skin". Clearly, my treatment did just that and was way more than skin deep!! My acupuncturist has a four year graduate degree in Chinese Medicine in addition to a sports medicine degree. His analyses of my presenting conditions are rather metaphorical-like. They are holistic, combining the mind and body, quite literally stitching or seaming them together! I wondered how the two ever came to be separated? We are the sum of our experiences and truly those experiences are stored in our bodies in one way or another. How wonderful it is that medicine recognizes the need to treat the whole person, and it is a privilege to receive these acupuncture treatments! I can't help but feel that I was supposed to be evaluated for hemachromatosis again and right now, and at this particular center in order to receive these soothing treatments. I noted that my acupuncturist's chart is labeled in Chinese and I couldn't resist asking if he had to learn Chinese in order to learn this foreign treatment. He said that he didn't have to but did choose to learn the Chinese terminology that goes with these treatments and then rattled off what points he had used and what they tapped, all in Chinese! Acupuncture is a beautiful science and needle art. None of us will live forever, though the way I plan my quilt making, you would think that I planned to do just that! What a treat it is to learn and expand my awareness of the mind-body connection in order to become more fully present! Years ago I found a wise saying on a greeting card that I purchased and displayed on my desk, until it became a part of me. It read, "If you don't take care of your body, where will you live?" Knowledge of how to care and respect my body is growing, just like my knowledge of needle arts! Labels: Accupuncture; A needle art that stitches mind and body together to heal; Needle therapies of all kinds.